It was not easy to get through 2018. I knew that such challenges will happen anyways. First of all, I was feeling a bit anxious of the fact that my contract in another university was about to end and there’s no any chance that I would get a new contract. At that time, the chance of getting a fixed-term or continuing position was very slim. Second, I was feeling anxious of going back to the Philippines. Thinking of visiting home after being away for 4 ½ years from my homeland was overwhelming. Big changes and adjustments were definitely huge to process. And lastly, I thought that I will face a tidal wave of change, precariousness, and anxieties. Everything was up in air. But the universe got my back. Little did I know, I had so many people - my family, my partner, friends within and beyond academia, and lots of friends – all set to support, guide, care for, and love me. So, 2018 ended up not that really bad. I started the year by committing myself to writing in a diary. I bought a notebook, and then I started thinking of ideas to write on the blank pages. I decided to write a one-page entry per week. At first I was apprehensive to do such diary work. I thought that it would affect my super busy schedule at work. To my surprise, I found the writing exercise as very therapeutic. Words just flowed through my pen. In fact, I was just writing across places, or even while I was on the move (mostly in the train on my way to the city). It was a great exercise because it turned my solitude into wandering into a deep conversation with myself. I put my fears, laughter, anxieties, and even aspirations in the notebook. So by the end of 2018, I found myself writing the last two entries for 2018, in the same café where I made the promise to myself. I immortalised the many moments that were filled with a stream of emotions and ideas. My year was filled with such an array of contrasting experiences. These were captured through words in my diary. Sitting in a café, I went through the pages and just processed the many kinds of feelings that were contained in a narrative form. There were entries that I was very optimistic and gleeful. Moments with my partner, with my loved ones, with friends, and celebrations brought smiles on my face. It was just great to remember those great memories. I just thought that I was really enjoying the intimate, fun and light moments with people. The banal was turned into something pleasurable and worth remembering. Eating in a restaurant, having fun through a karaoke, watching a movie in the cinema, and travelling together were some of the delightful encounters. 2018 was also an exciting year for me because I finally had the chance to visit the Philippines for a one-month vacation after being away for four and ½ years. Yes, that long. How did that happen? Over the past years, I had to work hard to earn and save for my future.I was working so hard to save for a visa (which would cost around AUD5,000). So, instead of going back home, I opted to stay back and save money. Since completing my PhD, with the scholarship being cut, I then also had to find ways to pay rent and buy food. On top of this, I was also using my time to publish so I can eventually find a job in academia. So, instead of spending time vacationing back home or elsewhere, I was using my time to work on producing many outputs as I can. Somehow my hardwork paid off when I got a one-year fixed-term contract in 2017. However, during those times, I just realised that I just couldn’t work non-stop and miss the moments and encounters with my loved ones back home. So then at some point in 2018, before my contract ended, despite the uncertainty on what job would I get, I decided to go home for a vacation. I told myself, “It’s time to be home.” In fact, I was teary eyed in the airport. I just couldn’t contain the feeling, the idea, and the reality, that I will be reunited with my family and friends in the Philippines. Such emotions were captured through my diary. Meanwhile, I wrote an auto-ethnography of my vacation. I was writing on a reflexive diary for 30 days. And whenever I read the entries, it’s as if the world would stop and I would be transported back to a particular scenario or moment. Nevertheless, giving in to the call of visiting home was energising. Life is not simply made of rainbows, cotton candies and a parade of glitters. 2018 tested my spirit, my resilience, my decision making, and my true personality. I had to let go of a job somewhere because I made a decision not only for myself but also for the people I love. And during those days that I felt everything seemed unclear and hopeless, I somehow found strength. With support and inspiration coming from many people, I kept going. In 2018, I published a book review, a journal article, and a book chapter. I also had the chance to participate in the 2018 Digital Media Research Centre (DMRC) Summer School (where I made great friends and met amazing scholars!). I presented in conferences. I did guest lecturing. And I was also invited to deliver talks in a seminar and a conference. I also did a radio guesting at SBS Filipino to speak about transnational caregiving through mobile devices. More than this, I was able to revise and submit a book proposal based on my PhD. And before the year ended, together with my other two co-collaborators, I submitted a research grant proposal. I was also very lucky to receive mentoring and support from my colleagues in academia. 2018 was also a big year because I joined the School of Communication and Creative Arts at Deakin University as Lecturer in Communication. The past year was also about strengthening and nurturing relationships. I fulfilled my goal of spending more time with the people I love. I reconnected to my family and friends back home. It all happened in one magical evening when I had my birthday/graduation party. In fact, preparing for the party was very helpful to distract me from thinking too much about my precarious future in academia. At the time, my bestfriend and I were planning the event, I hadn’t received yet the decision of the university where I applied for a lecturing job. So instead of panicking and going crazy (which stories and sentiments were captured through my diary), I paid attention to planning the party and my vacation in the Philippines. It was overwhelming to be home, but at the same time, nerve-wracking! I had major adjustments, given the asymmetry of infrastructures between the Philippines and Australia. Nevertheless, the journey to the homeland was fulfilling and unforgettable. I realised that one’s journey as a scholar can also be shaped by collective engagement. To grow as a scholar is to sustain and value networks, relationships and collaborations. In 2018, connections with great scholars had been pivotal in my growth as an individual, migrant and as a scholar. As an individual, I developed friendship and camaraderie among Early Career Researchers (ECRs) and academics. As a migrant, I was inspired to keep fighting for those who are disenfranchised in our society. One must use one’s privileged position to enlighten, to support, and give voice to those who are silenced. In addition, as a scholar, I embraced a commitment to delivering excellent, innovative, critical and innovative research and teaching. As a digital media scholar, I envision my students to use all of these readily-available platforms to challenge social systems, call out any forms of social abuse, and help those who are in marginalised conditions. On a lighter note, I enjoyed 2018 because of our Netflix, Stan and TFC (The Filipino Channel) subscription. I began watching ‘Black Mirror’, which got me hooked given the fact that I research on digital media. In fact, I created review of all the episodes in one of my academic diary. I also got addicted watching ‘RuPaul Drag Show’. The transformations of RuPaul and her ‘geeeeerls’ were phenomenal. The creativity of the contestants was impressive. I also loved the language used by the show. And because I was just so addicted to that show, I even told my friend who was seeking for an advice from me about ‘staying’ in academia: “Publish for your laaaayf!” We both laughed, RuPaul style. Meanwhile, having TFC (The Filipino Channel) subscription made me feel more connected back home. I had the chance to watch Tagalog news, movies, shows, and many more. I would like to take this opportunity to thank the loveliest people who made my 2018 such a wonderful year. Thank you to my ever-supportive partner, Guy, for making sure that I don’t fall into bits and pieces. He has always been a constant source of happiness, optimism, strength, and love. My partner’s family has also showered me with so much kindness and care. To my dad and my brother, and his family, for always reaching out to me especially when I’m feeling too stressed about work. And my friends in Brunei and in the Philippines – Eliza, April, Elmi, Jhen, Ed, Melody, Maitel, Jayson, Ma’am Elyrah, Lory, Eunice, Peluchi, Ces, Janine, Claire, Dennis, Mar, Grace, Mike, Celina, Pat, Alex, Jovan, Chuckie, Darwin and Janhart, UP friends, and AusAid friends, super thank you for always being there for meeeee. To my amazing Filipino friends in Melbourne – Eden, Cheenee, Maria, Nina, Jappy, Oscar, Jackie, Mursha, Tita Gina, and Tito Elias – salamat for the food fest, chit chats, and karaoke moments! Of course, my journey in academia has been amazing because of my generous academic friends – Akane, Kate, Jenni, Indigo, Emily, Fan, Robbie, Suneel, Benjamin, Angela, Cesar, Dan, Amelia, Natalie, Paul, Crystal, Brady, Ben, Son, Gilbert, Bernice, Cathy, Karla, Esther, Sunshine, and Elaine. Friends in Monash have also been great in helping me get through the tough times – Christine, Kei, Anubha, and Zola. I am thankful for the continued support given by my Filipino friends in academia – Che, Lia, Jason, Jonathan, Nicole, Jocelyn, and Liezel. I have also been lucky to receive support and mentoring from my former PhD supervisor Brett Hutchins, as well as Kate Fitch. Great encounters, engagement and conversations made an amazing impact on me as a person and as a scholar, and so I thank the scholars in such moments: Amy Dobson, Tama Leaver, Nic Carah, Rowan Wilken, Jean Burgess, Larissa Hjorth, Anthony McCosker, Kath Albury, Loretta Baldassar, Donnell Holloway, and Gerard Goggin. Many thanks as well to Cat Gomes for giving me some useful advice on thriving in academia. Of course, lots of cheers to Monika, my co-convenor for the Asia-Pacific Digital Cultures and Society. Thank you as well to Tseen Kho for giving some fantastic advice on a collaborative project as well as on being an academic. I would also like to thank my friends who have been helping me heaps in my adjustments at Deakin University – Amelia, Natalie, Andy, and Alexia. Deakin people like Emily, Kristy, Browyn, Dierdre, Allison, Janine, Jian, and Pauline have also been there to help me work through my way in a new environment. I will be forever grateful for these kind souls. I have been reflecting on what I want to achieve for 2019. First, I want to keep nurturing relationships. This could be achieved by making sure that I am able to stay connected despite my busy schedule. I do hope to visit the Philippines again this year. It’s just amazing to be home. Second, I want some stability in my career. I hope to get a [--------] position soon, something super mega loooooong-term, so I can work on longer research projects and continue teaching. I am still looking for a post-PhD mentor who can guide me in my journey as an ECR and academic. I also want to further develop my profile as a scholar in the field of digital media, mobilities and migration. I want to publish my book soon along the many pending journal articles and book chapters. I am also excited to start working on some new projects for 2019, as well as my visiting scholar programme in the United Kingdom! Of course, teaching will always be part of my scholarly journey. I have been working on new strategies in teaching for 2019. I have also been doing some upskilling to teach my students in a digital media space this year. Fourth, I promise to achieve work-life balance by making sure I find time to take a rest or de-stress. So, this year I am doing a one-page diary again. However, the challenge is, I have to be creative in my entry. The entry does not have to be in essay form. It can be a drawing, a post it, a colourful something, and so forth. So I am calling my diary as “Creative EARVSpression!” Part of de-stressing could be trying a new hobby, singing, or anything that’s creative, fun and fulfilling! Fifth, I will take care of my health. Although I have been very particular in taking care of myself, I will pay more attention to really giving myself proper breaks and support. For instance, since I have flat feet, I will invest on good shoes so I won’t sprain my foot. Once this is fixed, I will pursue my goal of becoming a Zumba instructor! Perhaps that would fall into the category of fitness goals. Lastly, I will continue to serve nothing short of optimism, happiness, strength, and fabulousness this 2019. Glitters on! Photo taken by Earvin Cabalquinto, unless specified otherwise. Three weeks ago I subscribed to an online channel where I can finally watch a wide range of media content from my home country, the Philippines. I was just so excited the moment I played a content - an online news. I then started seeing familiar faces and hearing familiar voices. These people started to occupy the screen of my television. I just thought that the voice of the broadcaster reverberated in the living room of my apartment, or even in a quietness of my neighbourhood. Personally, the sound provided a sense of comfort. I just thought that such familiar voice of a Filipino broadcaster would just suddenly transport me back - imaginatively - to my homeland. It also brought back so many memories of growing up in the Philippines. Nevertheless, the moment of consuming a media content back home essentially provided a unique affective state which I would probably not experience if I am living with my family and friends in the Philippines. Being physically away but at the same time feeling a sense of connectedness was too strong. But more than this, the conflation of the physical and offline world generated disruptive feelings. It even made me think of how my sense of time has become mediated and messy through objects, practices and flows. ​We live in a mobile world. We are surrounded with mobile devices, platforms, as well as a wide range of digital information that constantly flow in all possible directions. Digital communication technologies and personalised data shape our everyday rhythms. We know that having the phone in our bedside table would basically impact our morning routine. Any sound coming from the digital device would wake us up because we know that such sound signals either an important message that has to be addressed or a phone call that should be picked up especially when there's an emergency. On an everyday basis, mobile devices become the instrument that constructs our movements. We are reminded with what we should be doing at a particular time because of the mobile device - either for work, going out with friends, or simply working things out with our family. But it's a different story in the case of migrant. Mobile device does not only serve as a lifeline to connect back home. It also moulds everyday movements, or perhaps the juggling of different worlds. Here, the mere presence of the mobile device as well as the sound it generates, and the information it produces could affect a migrant's rhythms. We know that meanings are assigned to objects. In such case, the device symbolises family bonding or intimate moments with a partner based overseas. Objects mediate our movements. In the first instance, the mechanical clock determines our activities - for work, family time, and other activities. We know that we have to meet people or do things at a particular set of time by just looking at the clock - the one on the wall. However, the advent of the mobile device has shown how mobile objects have reshaped our sense of time, as well as organise our movements. We no longer have to look at clock on the wall or be specific with our schedules. We can organise and re-organise our movements with others through the mobile phone. However, an object like a mobile phone can also mediate, organise or become an object to fulfil obligation especially among geographically separated families who sustain relationships through devices. In my case, the mere presence of the device serves as a reminder of what I should be doing especially in 'sustaining' relationships back home, and this is alongside my other activities that I have to juggle in Melbourne. Objects make us move, and so as emotions. These emotions could be produced by the meanings ascribed to the phone as related to knowing time. Further, proximity of the object entangled with the familial obligations certainly shapes movements and mobility decisions. For instance, with my phone beside me at 11 pm, I would be reminded that I should be calling back home. There are obligations to address. This is on top of juggling the time difference between Melbourne, Australia and the Philippines. Schedules have to be re-organised as well especially when daylight saving sets in. And if my phone is from afar, I don't see it, and I am not pressured to address a task for my family, then I am fine with moving around and just leaving my phone elsewhere. My point is, to connect and be connected is always stirred by an obligation to engage. Even if my phone is not beside me and I know that I have to contact my family at a particular time then I would search for my phone and make a call. But in times that the obligation to connect is not needed then the phone stays somewhere. Importantly, emotions move me to connect. And feelings are entangled with familial obligations. Of course, I don't want to miss an important conversation with my loved ones back home. And if I feel 'homesick' then I search for my phone or I make sure that my phone is within reach so I can communicate. Nevertheless, the mobile phone essentially constructs the time when I should be connecting, speaking or laughing with my family. And time differences have to be managed. But transnational connectivity can be very challenging as well especially when movements require energy and the worlds we all live in are uneven . One cannot just contact someone especially when the body is in a state of exhaustion. ​For the case of a migrant, everyday movements overseas do not only include addressing work life, doing grocery, going out with friends, travelling sometimes, or trying to stay at home to save money. A sense of time has been mediated by the features of the mobile device - platforms to use, apps to engage with, calling or texting, and so forth. However, for 'family time' to work, one needs, according to John Urry, a certain level of 'network capital' (the capacity to access instruments to sustain relations stretched across time and space). Through mediated interactions, the flows of the familiar voice could mend a lonely feeling. Further, visuals cues through Skype, which often need larger data to work, could mobilise a temporary escape from the pains of separation. They construct what it's like to perform 'family time'. ​Now that I have recently subscribed to an online channel back home, my personal time has been reconfigured. I do not only direct my attention to my mobile phone to embody a sense of home. This is because I can connect with my loved ones or I can imagine their ambient co-presence by seeing their images when I open Facebook. But I also consider other devices as a conduit to update me about what's happening back home, which reports essentially are not discussed in detailed by my loved ones. In here, what could be edited in conversations among family members would be presented in full details through the online channel. Separated family members often hide information from each other as not to cause anxiety or too much worrying. To be physically separated is already anxiety inducing. Of course the information through that channel curate the national and global issues that could impact a transnational life. One may ask, why not talk about the issues through phone conversations or through Skype? I say, it is painful. Ambivalence seems to have become the normalised affective state of living away from each other, and such feeling could be amplified when flows of 'horrible' stories takes center stage in national narratives. However, as supported by my own PhD research, accessing news back home matters because media content becomes a focal point in enabling mobility decisions and actions in relation to ensuring the safety of one's own family. So in my case having the connection to an online channel has opened new opportunities to see what's happening back home. Consuming Philippine news has become part of my daily activities. I have to know what's happening back home. Significantly, watching the news starts with 'knowing' that infrastructures of connectivity exist in my apartment. I know that I have an internet connectivity, the laptop and all the wires that would make 'online consumption' possible. And with the flows of information through the television, thanks to chrome casting, my sense of time is again reconfigured. This time, family time is no longer about having chats or bonding with my family. It's about accessing narratives that would allow myself to imagine the future of my family as well as my friends back home. Accessing online news reshapes my sense of time. It may be 10 in the evening in Melbourne but I watch the 6 pm news in the Philippines. I sometimes feel that my sense of time has become unstable and messy because of the conflation of the 'there' and the 'here' or even the 'a while ago' and the 'now'. Of course I would know the actual time if I look at my watch or if I see my phone because I am reminded of my phone that I should be talking to my dad at 11 pm Melbourne time or I need to speak with my partner. Notably, disruption of time is also enacted when the online channel uploads the content of yesterday's report. Time is even made complex when feelings start to occupy such mediated activities. The comfort associated with watching The Project (an Australian TV show) is in contrast with the feeling of seating in a very comfortable sofa while a Filipino reporter through the online channel presents the unimaginable consequences of a typhoon back home. Affect flows, sometimes stabbing, because of the contradictions of the actual life experienced by my left-behind family members as opposed to one's state of pleasantness in Melbourne. Through such feelings, all of a sudden, winter becomes as warm as hell because of the news accessed back home. Truth is, I draw reflections on such moments. The uncomfortable feeling constructs a sensation that sometimes makes me wonder about the asymmetries and pains created by a neoliberal society. ​Watching news back home at 10 pm always remind me of my childhood. I couldn't help but think about those days when my siblings and I would be scolded by our housemaid or by some of our relatives because we would be sitting in front of the television instead of eating at the dining table. It was routine mediated by the media. We would be gathering around the television. We would be watching but often would just stop and talk. There was a sense of comfort at that time. Consuming news was part of our everyday life as a child because we get to hang around as a family. We're there physically together. It was family time. But not it's a different story when I watch news online. Certainly, that feeling of comfort or of being in a space surrounded by familiar elements - the language, spaces projected through the television, and even the funny music - determines the embodiment of home. But it's a different story now. I am away from my family. I won't be able to do the family time again by watching news online. But I have to reclaim my sense of home as tied to practices and nostalgia. I thrive in pockets of moments which often burst when a wave of shock tends to be domineering. However, to achieve that proximity through mediated practices can also be painful. Knowing and processing what's happening back home can be devastating at times. Notably, 'homemaking' begins with the presence of infrastructures of connectivity. The phone, the laptop, the other many devices, and the cables allow for the flows of images, sound and text back home to happen. I benefit from this. I feel a sense of connection. But the moment I start devouring stories back home, I am moved in different ways. I always end up feeling overwhelmed and bloated. Too much, I say. And I ask myself, 'why watch?' The answer is, it's home. I consume information because such practice allows me to locate myself as a Filipino as well as think about my loved ones, my countrymen. And stories online as presented by the media also construct not only the present. They evoke the future. I am no longer thinking about the 'now'. I am subjecting myself to deep reflections about where do I move amidst the chaos brought upon by the constant disruption and denial of rights and justice in the Philippines. Whenever I watch news back home, I am reminded that consumption is mediated by the presence of the device as well as the obligations to know and affective states. And as I come to an end in watching the news, I ask myself, 'What time is it?" Really, here I am moving back and forth across space and time - imaginative travel it is - where I constantly try to find a settling feeling. Maybe I can find that peace. Yes, only in my dreams and not until my alarm clock goes off again. The black diary where I wrote entries for my auto-ethnography. July, 2018. Manila, Philippines. Four weeks ago I found myself in Tullamarine airport. It was 6 in the morning. It was a cold day, the usual winter 'feels' in Melbourne. I came back from a vacation in the Philippines. I was there for three weeks. Prior to that I stayed a couple of days in Brunei, a country where I spent more than four years of working in an advertising agency. It took me more than four years to finally have a vacation in the Philippines. The past years had just been so challenging that I didn't have the 'privilege' to travel back home. Despite as such, I have been blessed with a supportive partner and friends in Melbourne. They have provided a 'home' and a 'family' for me. But more importantly, thanks to digital media, I remain connected to my loved ones in the Philippines. It was a rejuvenating experience to be reunited with my family and friends. Hearing the wealth of stories while enjoying Filipino dishes was absolutely amazing. There was an instant connection. But of course before the left and right reunions, my mind was filled overflowing with anxiety. There were so many 'what ifs'. To be away from for long years wasn't easy. For sure, digital media provided the connection - on many levels. Facebook became the window to each other's lives. Short conversations over Skype and Facebook messenger were somehow helpful in fuelling intimate ties. But obviously there were bits and pieces that I couldn't just access and process though digital media use. So to deal with my anxiety at that time, I re-imagined the 'home' that I grew up with. There's that constant conversation with oneself. I was trying to locate myself in the landscape of change - big or small. But my feelings were just weak. Deep inside I wasn't sure on what might happen. And so I just let loose. I allowed myself to be moulded by every interactions and experiences back home. I had mixed emotions.It was intense. For a moment, I was feeling excited. I couldn't wait to see my family and friends, once again, in flesh. But at the same time, as I mentioned earlier, there was that unsettling feeling.I was overthinking on how should I act, move and interact with others to ensure that I do not turn into a stranger in my home country. I was trying to picture myself in a familiar place and moment. But to reconnect is not as easy as being physically present and working one's way through re-staging old habits and gestures. Things change. Big changes happened. And so there's that unpredictability that could only be managed by 'being' in the actual situation. I had to find a way to work around with the situation. With my own mobility, I had to anchor myself to the familiar. Writing became the magic pill that allowed me to be understanding, patient, flexible, and fully aware of the unparalleled realities. And so I thought of documenting my vacation in Brunei and in the Philippines. I started to work on my auto-ethnography or a research method wherein 'the self' is positioned at the core in addressing a particular social inquiry. The documentation, through diary writing, was not only deployed to curate my everyday and diverse movements. But such process was aimed at allowing myself to simply reflect on my own mobilities - physical and communicative. How do I experience movement? What makes me stop? What makes me move? How movements are shaped by my emotions? What is the role of infrastructures in enabling and undermining my mobilites? What are the meanings I ascribe to mobilities in my home country? So across the many pages of my notebook, I wrote my feelings towards my own movement, experience of space, interactions with my loved ones, engagement with technologies, and even a deep understanding of my identity. The last time I was back home was in 2014. I was in the Philippines for the field work of my PhD thesis. I was there for three months. During those months, I maximised every moments with my family and friends. But the priority at that time was to gather data for my research. Catch ups were done at the latter part of my stay in the Philippines. I eventually went back to Melbourne to complete the remaining years of my PhD. Hard work and focus paid off. I finished my PhD. But then again life can sometimes throw some tricks at you. I went through everyday challenges - of being a migrant looking for a spot in academia. Thankfully I have my partner in Melbourne and my friends who have helped me in getting through the most challenging part of my life/career. Great scholars also extended their generosity - they mentored me in many ways. They provided advice and words of encouragement. On a personal level, digital communication technologies also helped in enabling a sense of connection between me and my family and friends in the Philippines. Unfortunately, a very busy life can often deprive someone with intimate exchanges. So most of the time, I didn't have much 'energy' to speak with some of my family and friends back home. I just didn't have the 'right frame of mind' to converse. I was, at some point, exhausted. Conversations were then reduced to constant lurking online. Clicking likes and hearts became a way to enable co-presence. Somehow relationships were sustained. It's just that I also felt that I was missing so many things by simply perusing images, reading status updates and interacting through stickers and emoticons. In short, digital media use wasn't enough. In my recent vacation in the Philippines, I reflected upon and wrote on my own experiences. I thought of rethinking 'home' through the lens of a migrant. I am a migrant, and I will always be a migrant. Down the track I could be getting a PR or citizenship in this country. But this doesn't mean that I could simply erase my past. I am marked by my own mobility - moving from one country to another. To be a migrant is to embody and negotiate that constant feeling of finding one sense of belongingness. This could be hard work. There's always that push to determine one's position in our society, which processes often come with ambivalent experiences. And there's just that constant 'monitoring' of one's personal mobilities to feel part of a familiar environment. That feeling of permanent temporariness will never vanish. So as I moved from airports, continents, public spaces, and even taking a ride through a car or a crowded public transport, I felt that one big wave of realisation. I was, at some point, just became so fascinated with how changes within myself and my environment could create such intense hunger for re-connection. I moved back home for a visit because I had to find a piece of myself. It's home. I want the imperfect. I wanted to experience the humidity. I was craving for that world that I used to embody. At the end of the day, I couldn't just move without anchoring myself to what will set as a foundation of my present and an understanding of my future. Everything is, and should be, connected. Movements will only work if there are 'stable' links or interconnections. More than forging connections back home I was moved by what I saw, experienced and grappled with. As a migration scholar, I see movement as asymmetrical and even discursive. One's access to resources would definitely matter in the construction of journeys - on a physical and digital context. For some, spatial mobility could be deployed to achieve social mobility. But not all stories contain sweet and mouth-watering endings. In the context of Philippine migration, spatial mobility among other migrants could also mean opening oneself to abuse and exploitation. Thanks to our government who has been serving the capitalists and local elites. With reflexive thinking, I acknowledge my privilege position in our society. But I do not on allow myself to thrive on such terrain. There's always a sense of awakening triggered by what I see, hear and feel. In my recent vacation in my home country, social inequalities are performed and experienced in the streets. I saw the result of the asymmetrical access of the Filipinos to infrastructures. Everyday struggles were a staple for the majority. More than this, such unevenness in accessing and using infrastructures shapes the quality of movements - painful, forced, constrained, and even hellish. This made me think the stratification of mobilities. And I documented such realities in my diary. I aim to write a journal article based on my auto-ethnography. Perhaps a conference paper can be developed too. In my work, diary writing was paired with visual methods. I was capturing moments. I was photographing objects. I was curating my own experiences while on the move - across spaces, I must say. It was hard work. I had to constantly reflect, in a very critical manner. Thinking about my experiences of home, identity formation, micro-mobilities, and many other themes warrants the management of feelings. And at some point, re-reading the entries and looking at my photos have been an emotional activity. I am moved by the memories. But at the same time, conflicting feelings disrupt everyday movements. One has to re-learn the familiar movements that have been set aside for quite sometime to accommodate routines and practices back home. Indeed, coping with homesickness also takes time. I embody a mobile life. I moved from one country to another. I utilise digital communication technologies to sustain long distance relationships. My everyday life involves commuting, using digital media, walking, and all sorts of movements. They shape my identity, social mobility, and all other aspects of my life. But having a mobile life is resource-based. To ensure relationships work, so much time, energy and effort are needed. Indeed, a mobile life can also be filled with challenges. Conflicting feelings linger. One has to find a way to address such emotional ruptures. In a paradoxical world, I constantly juggle the incongruities of my choices in life. Here are some of the titles of the entries that I wrote in my diary as part of my auto-ethnography. Baby steps, I will work on my book project based on my PhD. It's a move that attempts to contribute in shaping conversations around 'stepping back', 'doing the work' and not just 'moving on' in the context of global migration. These movements generate different outcomes. More than this, one must not fear slowness and immobility for these moments allow critical reflections. I've been very busy, as usual, and I haven't had the time to blog. But at least I'm breathing. It's just that juggling research and teaching can be very demanding. This is on top of the gazillion of personal things that I have to do and accomplish as a son, sibling, friend, writer, academic, lover (haha!) and as a superstar (kidding!). Nonetheless, here I am and trying to blog and tell the online world, "I'm alive!" But let me share with you one of the things that is keeping me 'sane' lately. So I've started writing entries in a paper-based and private diary early this year. One day I was in a shop in the city and I just thought of buying a notebook and start writing about my thoughts on a wide range of topics which I often access through online and offline spaces. On a more important note, I promise myself to write down some of my ideas. I just feel bad sometimes that a great (for me) idea just vanishes without being 'immortalised'. Obviously the best way to capture my creative or critical reflections or ideas is to write them down. (1) On being a migrant - double displacement? (7) Im/mobility is a BIATCH! (9) One day, so when? (27) Participatory culture, by who, for who? It is important to note that these entries were written while I was on the move. You might be asking, "why?" Personally, I find it fascinating to reflect and write while moving/experiencing different environments.For example, I often write while I'm travelling to the city, eating alone in a cafe, waiting for a friend in a shopping mall, having coffee while 'people watching', or even getting frustrated on not being able to reach a high note (yup, I love singing!). But don't worry as I don't write while I'm in the toilet. Hashtag, GROSS! Although I'm imagining a funny scenario:I am singing in the shower (like hitting a Mariah song, yup some dash of postcolonialism!) and my voice is detected by a sensor, and suddenly I'll stop singing and I'll say what's on my mind and everything will be written on the diary. Digital pen with sensors? I sense a Black Mirror-ish drama. On a serious note, my entries essentially reflect my experiences as a migrant in moving in/through digital communication technologies.I do hope to publish my entries in the future. But for now let's keep everything in private. I am also drawing some of my upcoming small research projects from my 'musings' while on the move. So if you're thinking of writing entries in a 'traditional' diary then do it. You'll be surprised.I also suggest that you deploy critical autoethnography. Write those stories and experiences by reflecting upon your position in our society. I would like to invite you to my upcoming talk. 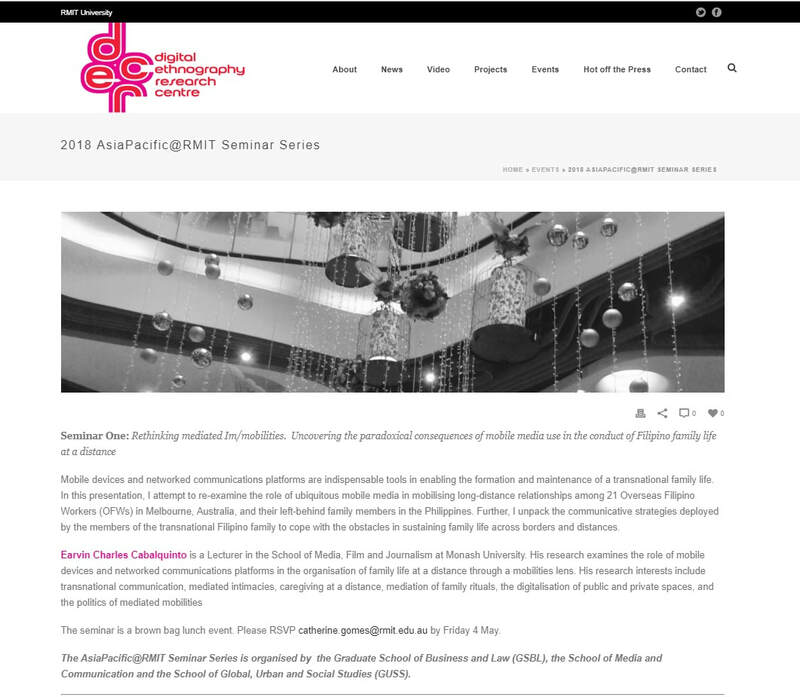 I will be presenting a paper entitled "Rethinking mediated Im/mobilities: Uncovering the paradoxical consequences of mobile media use in the conduct of Filipino family life at a distance" in the 2018 AsiaPacific@ RMIT Seminar Series. Check the LINK. I am looking forward to a critical discussion on re-imagining the role of digital media in engendering and undermining transnational connections. It's already past 11 in the evening here in Melbourne. I was working on a proposal for a new research project. As I was browsing some scholarly work, I saw the book by Tim Creswell. As I flipped through the pages, I saw one quote that struck me. "In this world it is important to understand that mobility is more than just about getting from A to B. It is about the contested world of meaning and power. It is about mobilities rubbing up against each other and causing friction. It is about a new hierarchy based on the ways we move and the meanings these movements have been given (p. 265)." The quote was just spot on to articulate contemporary mobilities. Everyone seems to be on the move, including the global elites, international students, young professionals, migrants, and refugees. But all of these movements are uneven. Referring to the work of John Urry, mobility is resource-driven. One's various capitals that allow movements are different from another person's access to resources. In this sense, some people have become mobile. They can travel from point A to point B without being stopped. Flows are very seamless. Think of the global elites who access and experience premium or worldclass services. In contrast, there are individuals who experience constrained mobilities. Movement across places can become coerced, bumpy and political. A case in point is the ways in which migrants, refugees or vagabonds navigate a mobile world. For them, the world can become unbearable. They do not have a place to stay. They are compelled to move because they are often feared, coded as a 'foe' and just not welcome across places. Think of anti-immigration sentiments that often place migrants as scapegoats in a globalising economy. Of course, mobility is also coded based on gender, age, class and ethnicity (Urry, 2007). Nevertheless, movements are not only embodied through practice. With attached meanings to them, invisible fences are raised to favor certain groups and individuals. Indeed, this then shows how mobility can be stratified, political, and negotiated. As I was reflecting for the past days about my personal mobilities, it dawned on me that I've been living away from my left-behind family members the Philippines for more than nine yeas now. In March 2008, I embarked on an overseas journey. I was in pain at that time as I was coping from the death of my mother, who passed away in 2006. It was just a stressful to come home every night and miss a familiar voice and face. I was very close to my mother. We were like super friends or bffs. But everything changed when she passed away. So during the darkest days in life, I hoped and prayed for a change of environment. So when I was offered a job in an advertising company based in Brunei, I said, 'yes'. In living overseas, I tried my best to mend the pain of losing someone dear to me. I guess being transplanted into a new environment really helped me. It's as if I was reborn at that time. I learned to move in a new territory. I encountered new faces. I dealt with a new culture. I had to work with clients from diverse cultural backgrounds. I had to train myself eating Malay food, which I loved! Importantly, I had to rely on digital communication technologies to sustain connection to my family members and friends in the Philippines. Indeed, everything was just something that I needed to absorb. My personal mobility, of going overseas, I should say, was unlikely a smooth travel. It was a movement that I always had to negotiate. I managed to address my personal battles with another painful experience - to be away with my family. As I moved to another country, to be specific, an Islamic country, which is Brunei, I subject myself to years of temporality, ambiguity, longing, and at some point precarity. Presenting and connecting my overseas experiences was the way I used mobile devices on an everyday basis. In fact, before I left Manila, I promised myself to blog my first 365 days in Brunei. I achieved that. Too bad though as all the entries were deleted in Multiply. I won't detail so much of my story in this blog entry. But what made me write this post is how I reflected upon how mobilities are uneven. In a sense, my decision to move overseas was not only driven by a deep desire to cope with my mother's death. Importantly, I sought a better opportunity overseas. I joined the approximately 2.3 million Overseas Filipino Workers (OFWs). I also wanted to advance my career. To date, I am navigating and managing a mobile life. I'm now in Australia. I've been here for more than five years now. But up to now, I'm still learning and unlearning so many things. I don't consider myself lucky by comparing my own mobility over others. However, I consider that my social position - cultural, social, political, and economic background - may allow me to differentially navigate a world. Yet such mobile capacity will always be represented, interpreted and 'tracked' or undermined by the broader social structures in our society. This is most salient in a neo-liberal or market-driven society. In this case, I am moved by Massey's contention, suggesting that individuals and groups are differentially situated across places, institutions, and in our society. Again, to articulate this is to examine how movements of 'mobile subjects' are categorised and controlled in various spaces. Welcome to a stratified and resource-driven society. My journey has just started. The aim for this year is to start writing my critical auto-ethnography on this page. At the core of my narratives is a deep and critical reflection on my personal mobilities, unraveling the paradoxes of mobilities - corporeal and imagined. As a mobilities scholar who locates the mobilities lens (Urry, 2007) in the context of mobile media studies, I aim to identify and examine the politics of mobilities (Cresswell, 2010) as performed, embodied, negotiated, and experienced through my personalised use of mobile devices and networked communications platforms in everyday life. I will use my experiences as an academic and migrant in Melbourne, Australia. Reflexive approaches are to deployed as a critical lens in revisiting, rethinking and re-imagining the entanglement of personal background/position, social spaces and networked platforms in organizing, performing, negotiating, and experiencing a mobile life. "Different social groups have distinct relationships to this anyway-differentiated mobility: some are in charge of it than others; some initiate flows and movement, others don't; some are more on the receiving end of it than others; some are effectively imprisoned by it (p. 62)." I recently created a Facebook page where you can now access some useful information related to digital media research. I will try my very best to share essential information to help us rethink how we can use a 'mobilities lens' by John Urry in re-examining the digitalisation of our everyday lives. The Facebook page can be accessed via clicking this LINK. 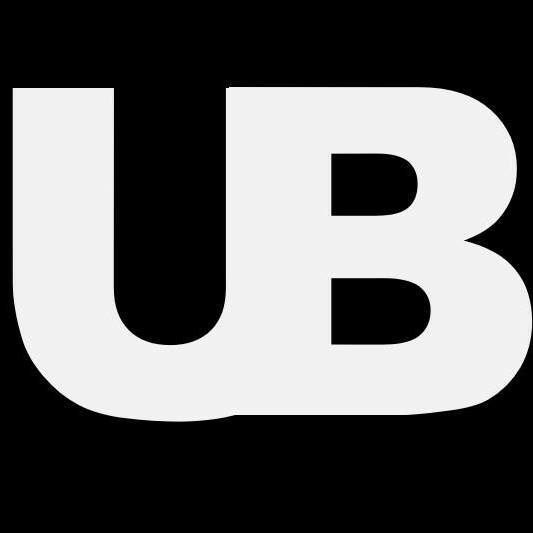 I also created a special logo for UNBLACKBOX. I hope you like it. The primary objective of this 'blogsite' is to discuss some concepts and issues related to mobile device use or mediated mobilities. I am interested in exploring the different forces that shape our use of mobile devices and networked communications platforms. These include factors such as socio-political, socio-economic, socio-cultural, and socio-technical. In my research, I pay attention to the 'stable' structures and 'immobile' infrastructures that engender and undermine movements. For example, gender norms often produce 'differential' and ambivalent experiences among users in a transnational context. Plus, the lack of access to broadband connections among individuals in remote areas causes 'digital divide.' And if we dig deeper, the 'have-less' can be 'immobilised' in their disenfranchised living conditions. I am also very interested in uncovering the 'immobilities' or 'fixities' enabled by mobile device use. Importantly, I seek to unravel the 'paradoxes' and 'tensions' that are often overlooked in discussing mediated mobilities or mobile device use. Essentially, I would like to open up conversations on how we can situate the mobilities lens in the context of media and communications. Welcome to my academic blog. This site will serve as a platform where I can share my views about how mobile devices and communications platforms are impacting our lives. The discussions will be initiated by engaging with two main strands: mobile media representations and mobile media practices. To give a little bit of context, mobile media refers to smartphones, tablet computers, and an array of broadband-based mobile communications platforms such as mobile apps, mobile Facebook, and so forth. 'Mobile media representations' include 'media texts' - a television show, a film, an advertisement, a YouTube clip, a meme, a selfie, and so forth - that portray the integral role of mobile devices in mobilising digital lives. I will focus on media texts from the Philippines, my home country, as a focal point of my analysis. This approach will enable me to contribute to our understanding and 'critique' of the consequences of mobile communication in local, transnational and global contexts. 'Mobile media practices' encompass my personal experiences and observations in using mobile devices and communications platforms on a daily basis. I will use a 'transnational lens' to locate and examine such mobile practices. Identity formation, sustaining long-distance relationships, connecting to the homeland, or adjustments or struggles in a foreign territory are several contexts that will be taken into account. Through this blog site, I endeavor to illuminate a critical viewpoint on our perceptions and experiences of mobile media use. To 'unblackbox' is to articulate how the use of a mundane, invisible and taken-for-granted mobile technology can be 'deconstructed' and critically analysed, thereby opening conversations on how power asymmetries and social inequalities are often perpetuated in the age of smartphones and social media. Factors such as age, gender, social class, race, ethnicity, as well as cultural values, will be considered in the process of 'unblackboxing'. More importantly, based on the work of British Sociologist John Urry, I will primarily employ a critical mobilities lens across forthcoming entries. Apart from sharing my insights on the 'politics' of a mobile world, I will also use this site to post academic and student resources, tips on surviving a PhD, and managing a post-PhD pathway. This online space will also update you about my ongoing research projects, conference paper presentations, and academic-related activities. Feel free to comment on my upcoming blog posts. I am Dr Earvin Charles Cabalquinto. My research interests lie in the intersections of digital media, mobilities and migration.